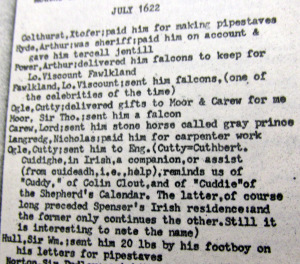 Extracts from Diary 1622 of Richard Boyle, Great Earl of Cork, on Nonpayment by Blind John Power, of Rectorial Tithes, including Caheragh, Creagh, Kilcoe, Schull, Myross, West Cork, Gift to Lord Beaumont Departing, of Gelding, Caste of Falcons, Merlyns, 9 Barrels of Irish Fryce and Barrell of Pickled Scallops used for Food by the Irish, Sending Cutty (‘Cuidighe’ Irish for Companion) Ogle to England. 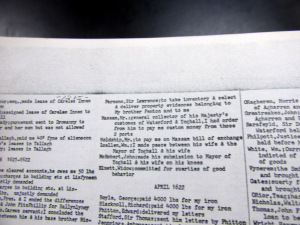 The tithe references are possibly a relict of the Norman incursions to West Cork. These areas belonged to either St Catherine’s of Waterford or the College of Youghal. They appear in the accounts books of St Finbarrs Cathedral Cork, from the 1780s, the ledgers are in pristine condition in the RCB Library in Rathgar, Dublin.